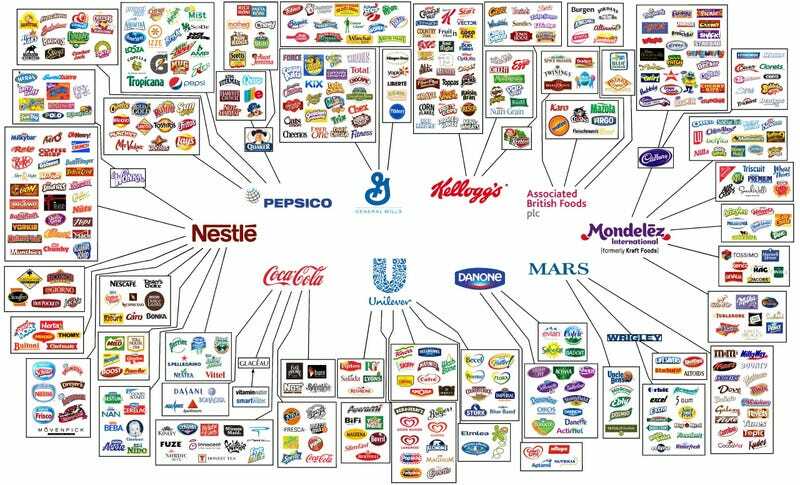 In the supermarket—as you can see in the graphic at the top—Mondelez, Kraft, Coca-Cola, Nestlé, Pepsico, P&G, Johnson&Johnson, Mars, Danone, General Mills, Kellogg's, and Unilever own everything. This graphic is sightly outdated, but it shows Johnson&Johnson's brand connections. The graphic on top is up to date. It doesn't stop in the supermarket, of course. Our money is all in the hands of a few megacorporations too. Here's all the stuff that merged into Citigroup, JP Morgan Chase, Bank of America, and Wells Fargo since 1996. Now, according to MotherJones, 54% of all the financial assets in the United States are owned by just 10 institutions. This graphic is from 2003 but it shows all the connections between all brands, from liquor to clothing to music labels. Got any other curious graphics like these? Post in the comments.